Cloud lights are increasing in popularity due to their ethereal beauty and whimsical style. Many people are using them in nurseries or playrooms, although they can create an interesting effect in any room. 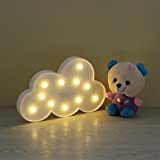 They may look complicated to make, looking so realistic, but really, you can make your own DIY cloud light with just a few items and some time. Follow the tutorials listed below to make one of these unique lighting pieces! To make this DIY cloud light, you’ll need some different sized paper lanterns to create different looking clouds. Use real clouds for inspiration so your light will look realistic! Cotton stuffing is hot glued all over the lamps; and inside are LED lights, which won’t heat up that much and are light enough to hang with fishing line. 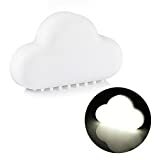 Add some LED lights hanging down from your cloud light and you’ve got an adorable rain cloud! This light is attached to a long wooden dowel to provide some stability. These LED lights flicker to simulate lightning, which creates a pretty realistic effect. The tutorial uses the cloud light for a baby shower, but you can use it for any event or as decor. If you want to use items you already have around your house or just don’t feel like going to the store, make a recycled DIY cloud light! This project uses stuffing from an old pillow or stuffed animal, plastic bottles, and Christmas lights to create an impressive cloud effect. Since the items are recycled, a price of $0 is a no-brainer! To create an even more interesting effect, this tutorial takes several different colored LED lights and places them in different lanterns. Try using purple, green, and blue to make an extra-terrestrial galaxy impression. This DIY cloud light is a perfect conversation piece for a trendy teen’s bedroom! This video is a good one to start with if you want to try out the cloud light trend without investing too much time or money. Only one lantern is used, so the lamp is smaller than most you’ll see on the internet. The light cord is used to hang the light, which can save you a little money in fishing wire, too! Another variance in the DIY cloud light is to use ‘fairy’ lights. Fairy lights are a little more delicate looking than other string lights and create a lot of contrasting color and depth to your cloud light. The result is mesmerizing! Watch the video below to make your own. If you want to try your hands at more lighting decorations you can try some DIY mason jar lights. 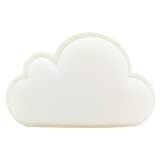 Perfect for any Disney enthusiast is this Disney-inspired cloud light! This light would look wonderful in a Disney-themed room, such as Frozen or Mickey Mouse. Of course, you can shape your light in different ways by arranging the lanterns differently, so use the tutorial below as inspiration for your own creation! If you want more of a space theme to your light you can make this galaxy light. It looks just like a breathtaking nebula and is just as easy to make as a traditional cloud light. The process is the same, but you use primarily purple lights to create the galaxy effect. Take your DIY cloud light to the next level by adding sound effects of a thunderstorm! This video tutorial will show you how to make a cloud light that uses a LED smart lightbulb to both illuminate the cloud light and add cool sound effects. This easy-to-do project will impress everyone who sees it! If you’ve got some extra dough and want a challenging project, try this Bluetooth enabled cloud light. It takes some soldering and programming, but the convenience of turning your light on and changing colors with the press of a button cannot be matched. This project costs upwards of $200, so be sure to research carefully before attempting the tutorial! As you can see from our list above, each light you make can be as unique as a real cloud. With only a few materials and a relatively low budget, you’ll have a stunning home decor piece that people will talk about! Use these tutorials to inspire your own creativity. The sky is the limit! Have you ever made a cloud light? Share your thoughts below!